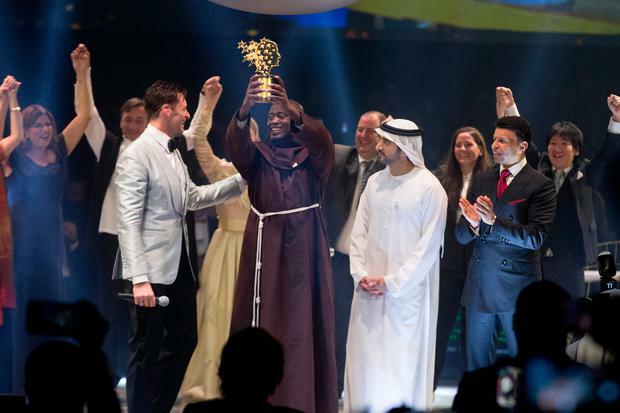 A Kenyan science teacher from a remote village who gave away most of his earnings to the poor has won a $1m (€900,00) prize that honours one exceptional educator from around the world. Peter Tabichi teaches in the semi-arid village of Pwani in south-eastern Kenya, where almost a third of children are orphans or have only one parent, and where drought and famine are frequent. Classrooms are poorly equipped and the school, which teaches students between 11 and 16-years-old, has just one computer with intermittent internet access. He was selected out of 10,000 applicants for the Global Teacher Prize. It was Mr Tabichi's first time on a plane going to Dubai for the ceremony, which was hosted by actor Hugh Jackman. Despite the obstacles Mr Tabichi's students face, he's credited with helping many stay in school, qualify for international competitions and go on to college. The prize is awarded by the Varkey Foundation, founded by Indian philanthropist Sunny Varkey, and chosen by a global committee of educators.